Our second stop in this year's #VABreweryChallenge was a short trip to Mad Fox Brewing Company. 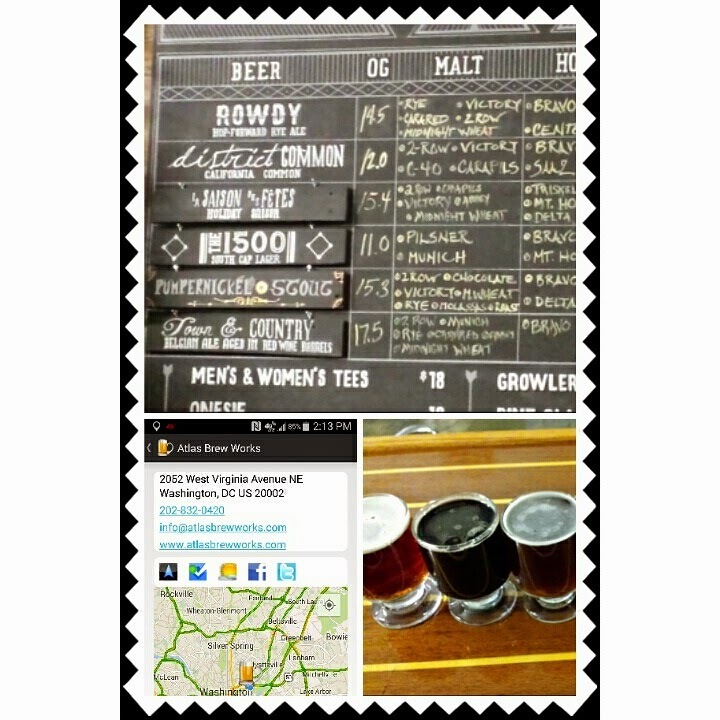 Readers may be familiar with the MyJoogTV episode filmed at this brewpub and its proximity to the W&OD bike trail. 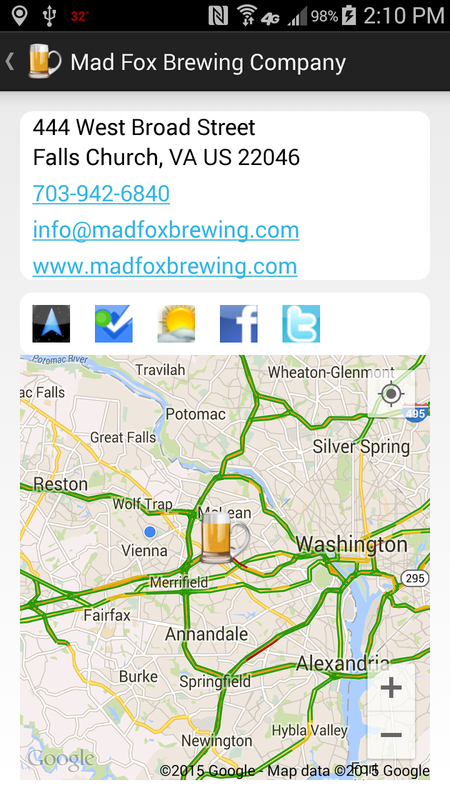 This day, Mad Fox had a full menu of beers available which included three cask offerings. One of these was a delicious St. Swithin’s E.S.B. (Extra Special Bitter) - and English ale brewed with English Pale and Crystal malts and lightly hopped with the English First Gold hop varietal. Also on cask was the Mason's Dark Mild - at 3.3% ABV - a perfect lunch beer. It's medium-dark, mostly sweet with a light hop finish. My clear favorite during this visit was the Cabernet Funk, a Saison that is dry-hopped with Citra hops and then aged in used Silver Oak Cellars Cabernet Barrels. This is a complex beer; spicy dirty, with a touch of tannins. And only 6.0% ABV. I'll probably return soon for their 5th Annual Barleywine Festival (February 21-22). Cheers. This past Wednesday, #WineChat featured the Turkish wines from importer Vinorai Wines. During the hour chat we learned several facts about the wine industry in Turkey such as DNA analysis shows that grape seeds were domesticated in Anatolia as far back as 9000 BC. Whereas Turkey accounts for only 2% of total world wine production, they are the 6th largest grape grower. There are four major grape growing regions: Anatolia, Thrace, the Mediterranean, and the Aegean - the largest. Anatolia produces wine from mostly the indigenous varieties such as Emir, Narince, Öküzgözü, and Boğazkere. They remaining regions have a more Mediterranean climate and specialize in international varieties, although the indigenous planting are increasing. 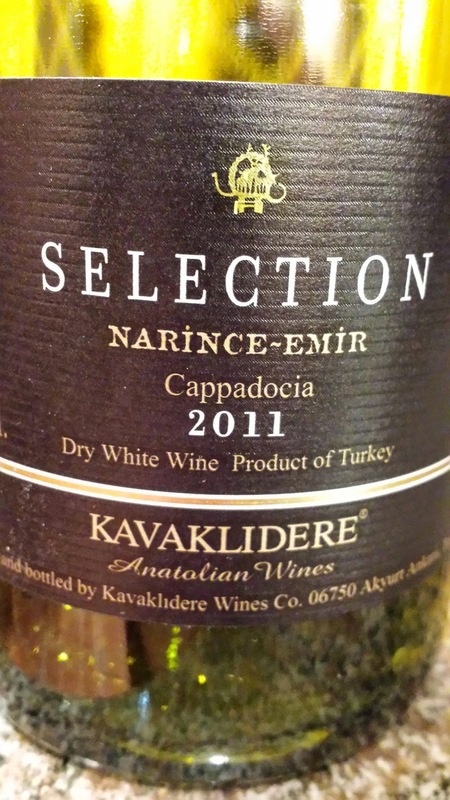 During the evening, I sipped on the Selection Narince - Emir 2011 from Kavaklidere Winery. Several of this winery's wines are available locally at Cenan's Bakery in Vienna, VA. The winery is one of the largest in Turkey and is located in Anatolia. The Narince and Emir grapes were harvested from vineyards in Tokat and Cappadocia. After fermentation, the wine was aged eight months in French oak. The result is a wine with a big aroma, a creamsicle texture, green apple and lemon flavor, and decent acids on the finish. And quite the value at $12. That should be an incentive to check out Turkish wine. Cheers. 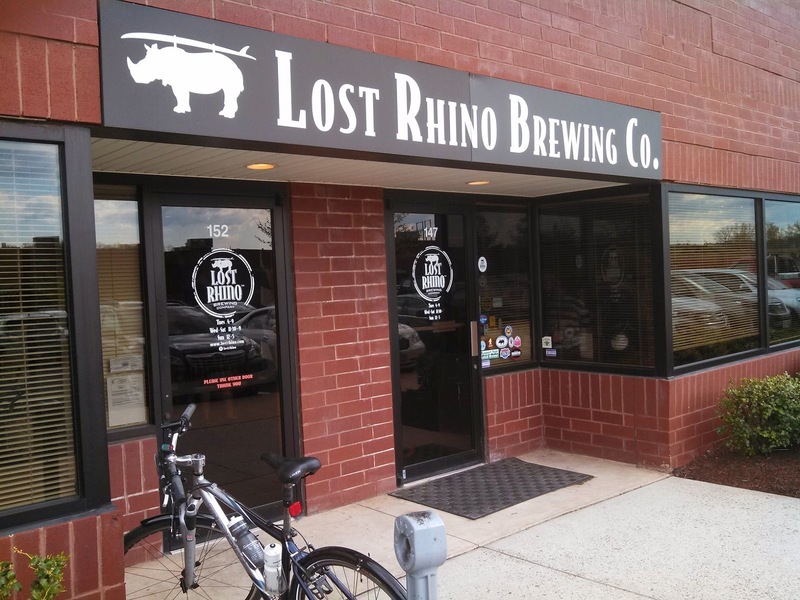 While enjoying a tulip of Tripel at Lost Rhino Brewing Co. on Saturday, my friend Chris and I heard about someone who visited all 100 Virginia breweries in 2014 (#vabrewerychallenge). Not afraid of a challenge, we committed ourselves to accomplish the same feat in 2015, with me raising the bar to visit the eleven breweries in the District (#dcbrewerychallenge) as well as the 60 or so in Maryland (#mdbrewerychallenge). 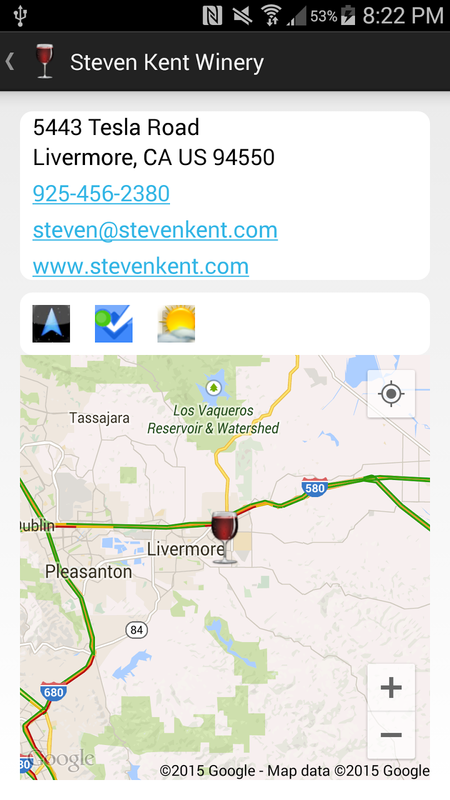 As expected, we will be using theCompass Winery, Brewery, Distillery Locator to navigate to these establishments. And I can image that Uber will be utilized often. 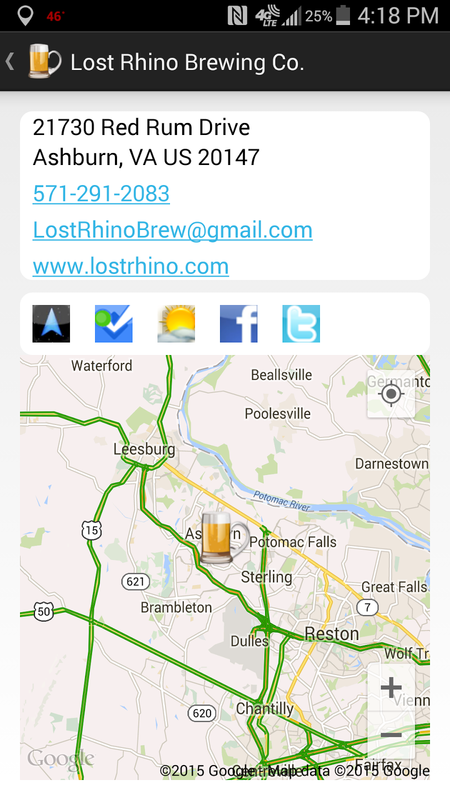 Thus #1 for the #vabrewerychallenge is Lost Rhino Brewing Co., located in Ashburn Virginia. Most should be familiar with their year round Face Plant, Rhino Chaser, and New River; but i tend toward the seasonal's - like the Tripel and brown ale styled porter - Why Nut? With decent food and live music on weekends, what's not to like. 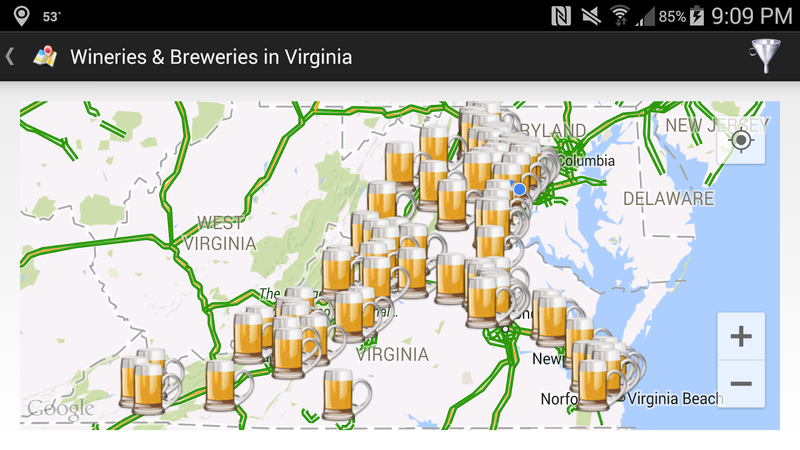 On Sunday I began the #dcbrewerychallenge at Atlas Brew Works, located in northeast near the National Arboretum. I was one of the first visitors, but by the time I had finished a sampler, the tasting bar was two deep. Atlas was the 4th craft brewery that has recently opened in DC and I was familiar with the brewery since their District Common and 1500 South Cap Lager are available at Nationals games. But three of their specialty brews hit home for me. First was the Rowdy Rye, I'm always in the search for rye, and this had a some edgy spices to balance the sweet malt. Next was the Pumpernickle Stout that includes some rye and molasssas - ingredients for pumpernickle bread. There is some sweetness to this beer as well but also some creaminess and spice. The final beer, the Town & Country, is outstanding. It's their Belgian Saison aged nine months in used red wine barrels. This process creates a complex beer - with many wine characteristics such as a strong cherry aroma and some tannins on the tail. Can't wait to share this one with my wine friends. 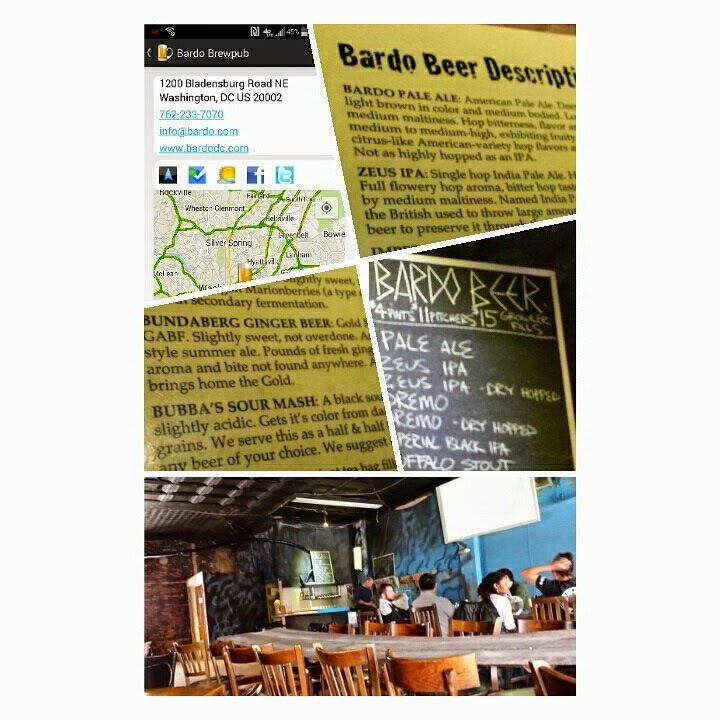 Brewery #2 for the #dcbrewerychallenge is Bardo Brewpub, located less than a mile from Atlas. 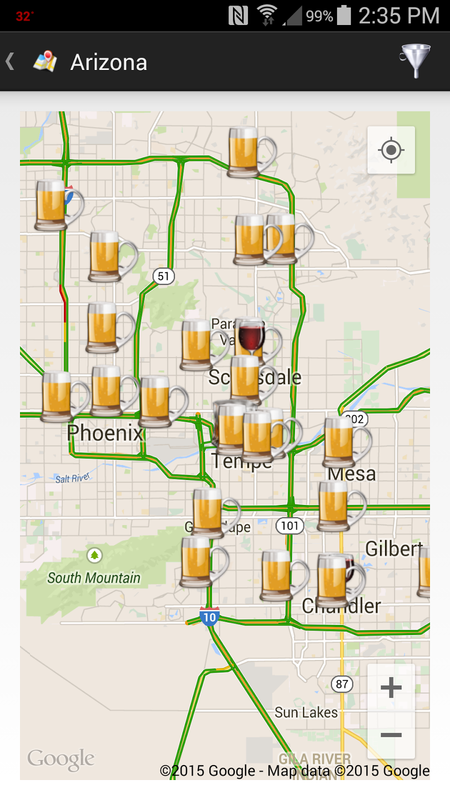 Pay attention, because if you miss the brewery, you need to travel several blocks to retrace. Bill Stewart initially starting brewing beer with Bardo Rodeo in Arlington Virginia in 1993-4 and at the time it was the largest brewpub in the country. His brother Andrew helped manage the brewpub. Eventually that location closed and the Stewart family renovated the current location and opened Bardo Brewery in 2013. They have an enormous outside seating area and a good sized indoor facility which was half full on this visit. 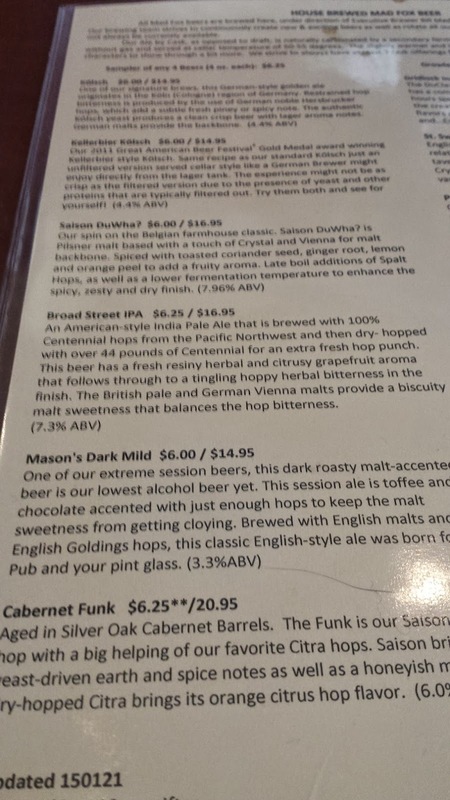 There were ten beers on tap, but once I saw the Bubba's Sour mash, I knew what direction I was headed. This is a tasty sour, black in color, tart in flavor, unfiltered for added complexity. Check back for our next challenge stops. Cheers. The January theme at Protocol #WineStudio is Wine Credentials: Letters of Distinction and to help sip our way through the discussion, samples of Steven Kent Winery to several participants. The winery started in 1996 with the goal of producing world class Cabernet in the Livermore Valley. Bordeaux grape varieties have been planted in the valley since the 1880's and many believe it's "climate and soils match those of Bordeaux’s left bank of the Gironde". And Steven Kent Winery is all about Bordeaux - producing wine from all five red varieties: Cabernet Sauvignon, Cabernet Franc, Merlot, Petit Verdot, and Malbec. The winery was also a perfect match for discussing wine credentials as they have a well educated tasting staff. The winery trains every employee on the Livermore Valley section of the California Wine Appellation Specialist® (CWAS) program from the San Francisco Wine School. And a full 90% of the staff continued with the entire program. That's impressive. For the #WineStudio twitter event, we tasted the 2011 Small-Lot Petit Verdot, Ghielmetti Vineyard ($50, 14.3% abv) and the 2011 Livermore Vally Cabernet Sauvignon ($48, 13.5% abv). The Ghielmetti Vineyard was planted by the Ghielmetti family in 2001-2002 and hosts vines from 10 different grape varieties. According to Tracey Hoff - VP Sales & Marketing, Petit Verdot thrives in the vineyard's gravelly soil, warm days, and cool evenings. Six barrels were chosen for the small-lot PV and the results are quite impressive. The 2011 Small-Lot Petit Verdot, Ghielmetti Vineyard starts off big, and I mean big, on the nose with dark fruit and tobacco leading to a complex mixture of blackberries, dirt, chocolate and some vanilla at the tail. 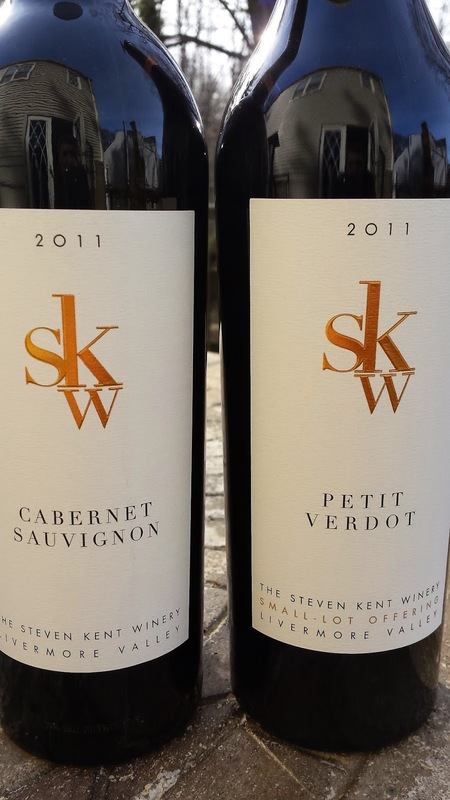 Quite often, 100% Petit Verdot can be one dimensional - plowing straight ahead - but not the Steven Kent. This wine has depth and character. The 2011 Livermore Vally Cabernet Sauvignon is also a well structured wine with the help of 5% Petit Verdot, 5% Merlot & 2% Cabernet Franc. The wine was aged 2 years in a combination of new and used French & American Oak. Being an acid hound, my first impression was the racy acidity, but there's also plenty on the nose - most likely an assist from the PV. The wine has more of a cherry undertone with similar notes of chocolate and vanilla as the Small-Lot Petit Verdot. And the finish is spicier on the sweeter side with more cinnamon than pepper. A solid wine. And catch the last night of #WineStudio's Wine Credentials: Letters of Distinction on Tuesday January 27th to learn about the San Francisco Wine School's programs on French Wine Scholar (FWS), Italian Wine Professional (IWP), and the above mentioned California Wine Appellation Specialist (CWAS)® program. Cheers. 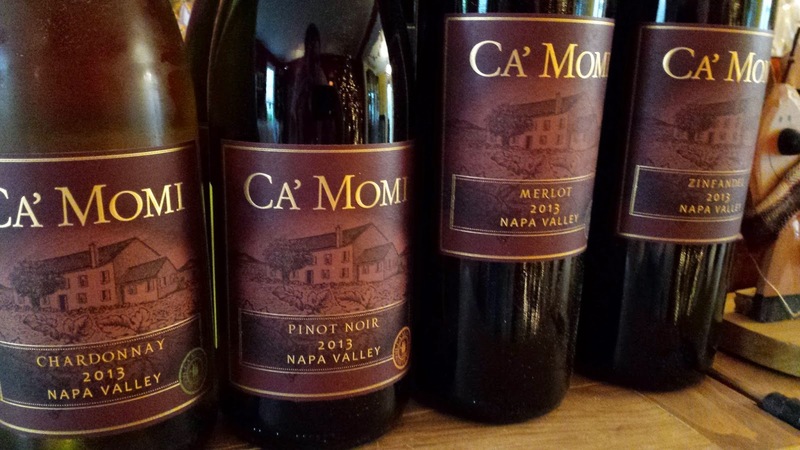 Just in time for the Christmas holiday, Ca'Momi Winery sent me four wines from their Napa Valley establishment. "House of Momi" honors the three owners Italian heritage, specifically, the name of the family house in Italy's Veneto region. The winery offers a few brands with the fruit sourced from the estate in Carneros or throughout Napa Valley. I received a shipment of their Passion brand, consisting of Merlot, Zinfandel, Pinot Noir, and Chardonnay. They also produce a Cabernet Sauvignon in this series. My first thought was that it will be intriguing to sample Napa Valley Zinfandel and Pinot Noir. And they both were tasty with the 2013 Zinfandel ($26) focusing on blackberry and spice and the 2013 Pinot Noir ($26) dark cherry. Both are fruit forward, easy drinking, with a shadow of tannins at the tail. Nice wines, but I would prefer other California regions with these varieties. The 2013 Chardonnay ($22) was a more typical Napa Valley wine with a big citrus fruit flavor, with vanilla and butterscotch in the mid-palette, and a but of spice at the finish. Good acidity as well. For those who enjoy a little oak, but not over the top, this is for you. 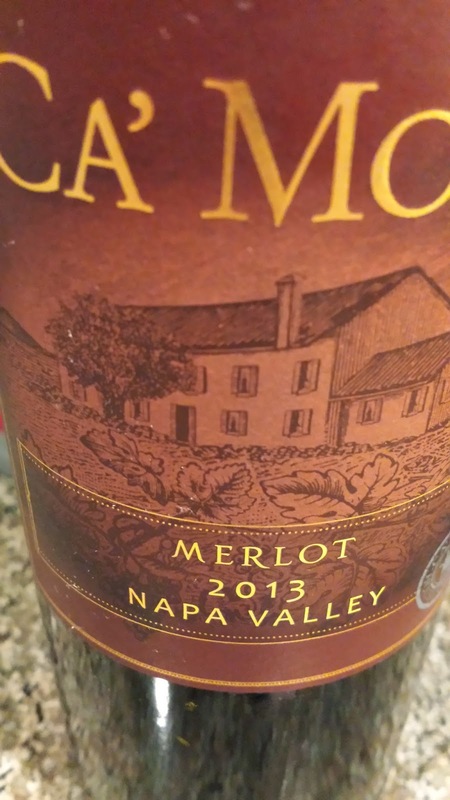 My favorite was the 2013 Merlot ($22). There's plenty going on in this wine starting with the cherry leather aroma, gummy berry flavor, dirt texture, pepper, and big tannins on the tail. Nicely done.